Saskatchewan Tourmaline Flower Brooch, gifted last year and first worn this year. The tourmaline brooch racked up three appearances for the year, an unusual amount for a new gift. This was the year of unusual brooches, but you sure wouldn't know it just by tallying up the brooches we saw most frequently. This year's favorites are much like the favorites we've seen in years past. 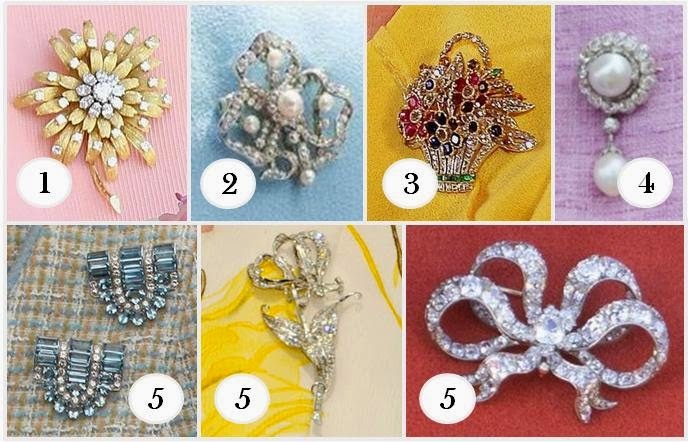 I was actually surprised the counts turned out so, well, ordinary, but with close to 70 brooches worn in the year and most appearing only once or twice, I shouldn't have been. The Frosted Sunflower tops the list for three years running (and countless times prior to this blog's start), and the only brooch here that has not made an appearance on either or both of our two previous year counts is the Flame Lily. And once again, the Girls of Great Britain and Ireland Tiara topped the favorites list, being used for all except the State Opening (where other gear is traditionally worn) and the Ireland banquet. It must also be noted that The Queen would have donned a tiara for at least one other event, December's annual Diplomatic Reception, but as usual we did not get to see inside the palace for that occasion. This was a no-brainer for me. Not only was it the only time we saw something apart from the favorite Girls (which is my favorite tiara, don't get me wrong, but I am a fan of variety more than anything else), it had been quite a few years since The Queen wore the Grand Duchess Vladimir Tiara with emeralds in place and other pieces of the Cambridge and Delhi Durbar Parure on display. It was an historic visit and Her Majesty treated it as such, to our great delight. As The Queen noted in her Christmas speech, this was a year of remembrance, and her appearance at the events marking the 70th anniversary of D-Day in France was a highlight. Despite all the new brooches in the air, her outing of Queen Victoria's Fringe Brooch (still not a normal selection for her, she'd worn it only once before) was my favorite for the year. Wearing such a massive piece for a daytime appearance conveyed how important the anniversary was, and it didn't go unnoticed that she selected a brooch which had been a favorite of her mother's for a World War II commemoration event. The entire state visit to France, centered around this anniversary, was basically one highlight after another. The Duchess of Cambridge wore two big pieces from The Queen's collection this year: the New Zealand Fern Brooch and the Nizam of Hyderabad Necklace. It feels as though the past few years have brought an increase in loans to others in the family, and these were the two most noticeable examples for the year. More of that, pretty please! This round up is already too wordy, but I could go on and on. It's been a tremendously fun year to watch what emerges from the royal vault, and I can only hope there are more surprises to come in 2015. It's already guaranteed to be an historic year, as QEII will officially pass Queen Victoria to become the longest reigning British monarch in history in September. Her Majesty will also welcome another great-grandchild when the second Cambridge baby arrives around April, and the first tiara event of the year is already on the books for a state visit from Mexico in March. The New Year Honours list has just been published, promising lots of interesting investitures, and I'm already hoping The Queen personally handles making Joan Collins into a Dame. A heartfelt thank you from me to all of you who have joined in the fun this year, and I hope you'll stick around for the next! Do tell: What were your favorite jewel moments for The Queen in 2014?